By saving yourself the time and hassle of lighting coals, infrared grilling is the ideal option for people looking to spend less time cooking on the grill and more time enjoying the outdoors. While the grills listed below are easy to transport, they are still large enough to grill up a few burgers or steaks. This makes them great for packing up in your car, truck, or RV, but a little too large for backpacking or hiking. 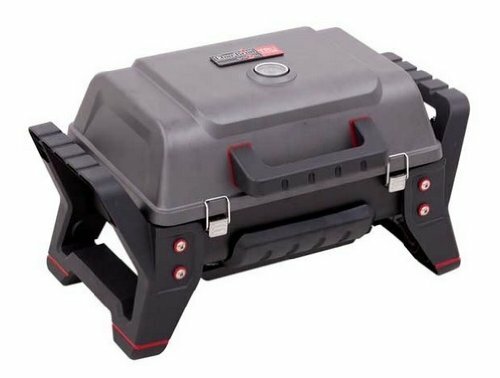 If you want a smaller infrared solution, you will probably want to go with our list of portable charcoal camping grills or ultralight grills – which weigh almost nothing but can still do some awesome cooking. Now, if you want a portable grill that is large enough for a family or small gathering, examine the following options. Here are the top 5 portable infrared grills. 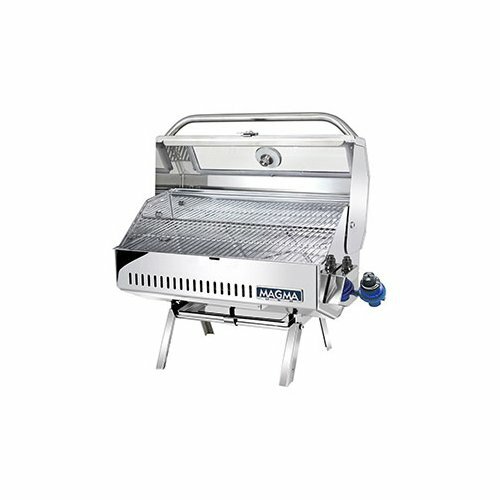 The Patio Bistro 180, from the popular Char-Broil brand, will give you the benefits of having a stationary grill with the size of a portable grill. This grill can be taken just about anywhere and has the heating power necessary to save time. The 245-square inches that make up the cooking area will provide enough space to cook for a small group of people. Luckily, even if you're cooking for a large gathering, the infrared plates heat quickly so that you can keep churning out burgers. You shouldn't have any trouble starting up the grill thanks to the Surefire ignition. This is an electronic ignition that is connected directly to the gas control, so the burner will light up as soon as you press the ignition. This is a common benefit of having an infrared grill: getting the grill ready to cook in a matter of minutes rather than close to an hour. The small, compact size and weight of the Patio Bistro 180 will make it easy to take to any park, campsite, boat, or deck. The drawbacks include the fact that it only has one 9,000-BTU burner, but it is also reasonably priced. The Solaire Portable Infrared grill may be small in size, but it packs a punch that will cook your food fast and with a taste that will leave your mouth watering. If you like taking your grill with you wherever you go, this infrared grill is a match. With some grills, it can be a chore achieving the desired temperature and preparing the grill. This is not a problem with the Solaire. You can start it up with the electronic push-button ignition, which should get the infrared plates going within a few minutes. This grill uses a one pound propane cylinder, which makes it even better for travel because you won’t feel weighed down when you are on the move. When you open the lid, you will notice the V-shape grilling grids that are used to maintain flavor within the food while deterring flare-ups at the same time. The cooking platform itself is measures 155-square inches, which isn’t the biggest surface area, but considering the fact that this grill produces 14,000-BTU an hour, it shouldn’t be too much of an issue to go ahead and keep cooking. If there had to be a downside, budget buyers may not be too happy with the price of this infrared grill. Though, if your'e willing to spend a few hundred dollars, this is one of the best portable infrared grills available. 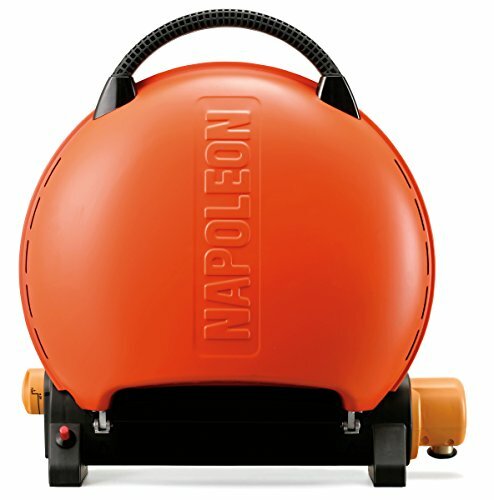 Though the Napoleon doesn't use “infrared” technology, it still does follow the same principle of using propane gas to indirectly heat your food. This allows you to avoid the propane flavor of direct cooking. This grill is one of the most portable on this list and it even comes with its own carrying handle! It comes with small legs as well, so you can use it in a variety of outdoors environments or just keep it in the back of your truck for impromptu grilling sessions. One buyer said that he uses it for cooking at work. Imagine being able to grill your own lunch every day! This is also one of the most stylish options on this list. Other advantages include a 225-square inch cooking surface and a 10,500-BTU burner. Is orange a good color? If you don't like the orange color, then you could consider this upgrade to the Napoleon listed above. This grill features TWO burners producing 12,000 BTU's. It's a little bigger, but still features the same carry-handle and fold-up portability of the 225 model. With this model you get a nice blue color, but more importantly, you can also get the scissor cart option so you can stand your grill up as well. You then have the option to place the grill on a table or stand it up in your backyard. The flexibility offered by the model 285 will definitely work for some people! 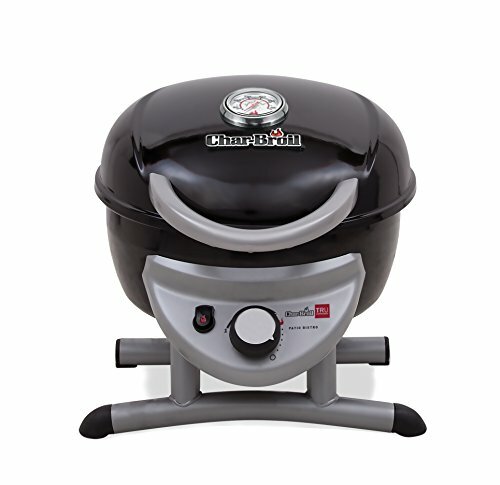 Nothing says grilling on the go like the Char-Broil Grill2Go grill. This portable infrared grill has a pair of handles that will let you easily pick the grill up and take it wherever you need to go. Char-Broil ensures durability with a rugged cast aluminum lid that strongly resembles a tool box. There are two stainless-steel latches that keep the inside of the grill secure at all times. No leftover debris or food particles will fall out when these latches are secured. With the Grill2Go infrared grill, you will have about 200-square inches to work with, which should be plenty of room when you are on the move. Fortunately, this grill is known to cook food fast, even on a low temperature, so those who are hungry won’t have to wait long. The push-button ignition will make it easier to start the grill, as you can simply press the button and wait for the grill to heat up within a few minutes. The TRU infrared cooking system ensures your food cooks evenly and quickly. You should also get a long lifespan out of this product thanks to its protective features. Finally at #5 on the list of the Best Infrared Grills of 2017 is the Magma Newport 2. This stainless-steel infrared grill is great for anyone looking to do some cooking on a patio or at a campsite. The integrated foldaway legs on the bottom of the grill will make it easy to set it up and then put away when you’re done. This portability is convenient for someone who grills on the move. There is also a tempered glass window located on the lid, which allows you to monitor your food so that it is cooked to your liking. Since infrared grills are typically used to cook food at a rapid pace, this feature is useful because it will let you see your food cook without having to inhale smoke from the grill or lift the lid. Most meats are handled very well on this grill, but be cautious of the meats that produce grease, because that can seep into the infrared plates and create overwhelming smoke. The stainless-steel construction will ensure users that their grill will last long no matter where it's used. 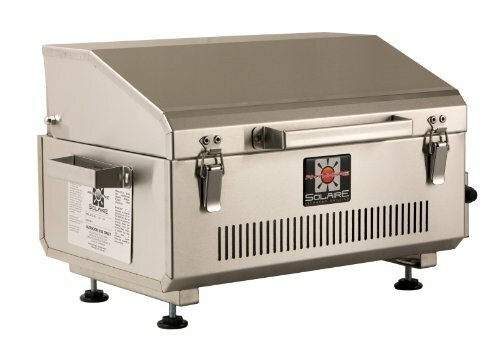 What Portable Infrared Grill Works Best for Me? Infrared grills come in a variety of shapes and sizes, so choosing the right one really comes down to where you’ll use the grill and how fast you want your food to cook. If you’re the type of person who likes to cook outside but has limited space or wants to carry the grill to other locations, you'll want a compact grill. 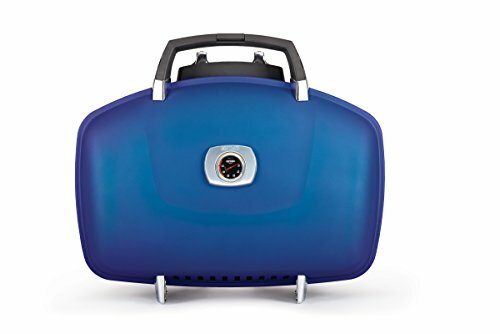 The Napoleon 285 (blue) is a great portable option. Just fold up the scissor stand and then put the grill in your garage, car trunk, or under the counter. The Magna Newport is a beautiful grill that you can pack away in the RV or truck, but if you're hiking into the back country, then you want to stick with something smaller like the Napoleon 225. Both Char Broil options on this page are also great picks for general portability in the infrared grill market. After thorough research, it is safe to say that the Char-Broil brand contributes the most to the infrared grill market. Although it is true that this is the most popular brand, you shouldn't discount the other options. Along with portability, you should look at the cooking surface of the grill. Make sure that you'll have enough room, based on the size of your typical gathering. Though, you should also be aware that infrared grills can cook food quickly and remain heated, so you can cook one serving after another. Portable infrared grills are quite appealing for a few reasons. For one, they are efficient. 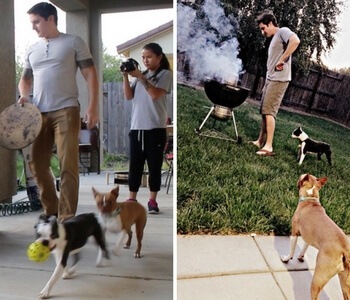 They use significantly less gas than the typical propane-fueled grill. Plus, when cooking with an infrared grill, your food should retain roughly 35% of its natural juices; enhancing the overall taste and texture. Infrared plates that are used within the grill will ensure that each section of your meat will be cooked thoroughly. That’s right, your food will no longer be cooked more on one side than on the other, as the infrared technology evenly heats the cooking surface. Cleaning your grill won’t be an issue either. Ever notice with charcoal grills that it takes forever to clean afterwards? You’re literally brushing the hard debris off the grate while inhaling dust coming from the bottom of the grill. With an infrared grill, the easiest way to clean the grates is to leave the unit at a high temperature after you’re finishing cooking, which will burn residue and other food particles into a dust substance. You then allow the grates to cool and simply wipe them clean. Safety and reliability is also a huge plus. If you've ever tried to cook with charcoal on a windy day, maintaining the right temperature can be a challenge – as can lighting the grill. With gas grills, you just don't have those problems, especially with the built-in igniters that are featured on most grills these days.